Pisa is said to be a “closed city” for the many walled gardens scattered throughout the center. Walking around, one cannot but notice trees and beautiful flowers suddenly peeping out from behind high walls in the tiny alleys of the oldest part of town. I’ve always been fascinated by private gardens. I also can’t refrain from peeping in windows at the street level when walking by… What can you do? I’m charmed by other people’s everyday life, by the infinite variety of life. When I first moved to Pisa, I used to live in a very old and beautiful square, Piazza Chiara Gambacorti, also known as Piazza La Pera for a pear-shaped sculpture of Etruscan origins located at the entrance of the square, on Via San Martino. The house that I rented with three other friends backed onto a private courtyard, and the two streets that flanked it ran through tall medieval buildings only for half their length. For the most part, they were comprised between high walls above which I could see trees. These walls were partly covered in thick bushes of climbing plants, behind which one could see old metal gates, blocking some old opening in the wall. I’ve always fantasized about life behind those walls, in beautiful houses with fabulous gardens large enough to host very tall, old trees, and so private thanks to the thick stone or brick walls. I imagined gardens like that depicted in Hodgson Burnett‘s famous book (The Secret Garden, 1910), that I had devoured when I was a kid. Over the years, I’ve learnt to look up when I walk or bike in Pisa (not always safe but always rewarding!). I have come to realize that there are many such gardens scattered throughout the older part of the city. Most medieval and renaissance noble buildings must have had large, private courtyards, where the family life took place. Here is a google map where I have pinned the gardens that one can “get a glimpse of” when walking in the center. Every year, in June, Association “Arcadia” of Pisa, organizes guided visits of the most beautiful private gardens in the city. An amazing opportunity to see the secret life of this “closed city”. Just to make clear that you don’t necessarily need to creepily peep into other people’s gardens if you are looking for a bit of greenery… Pisa has many public green areas too. The Field of Miracles itself is a much beloved area where students and locals gathered when the first warm days of spring arrive. Giardino Scotto: once a fortress designed by the famous Florentine architect Giuliano da Sangallo, at the beginning of the 19th century, it was transformed into a garden for the Scotto family. It is a fabulous place now, especially after the renovations of the arcades and of the paths. There is a gigantic platan which was planted on the occasion of a theatrical performance given by Carlo Goldoni. The garden hosts a number of shows in the summer and it is also used as an open air cinema. There is a lovely children’s playground. Dogs are not allowed. Le Piagge is the name given to the park on the north side of the river. It’s very popular with joggers but it is also perfect for taking a walk with your dog or just to enjoy some quiet time along the river Arno. There is a nice bar with a panoramic terrace at the beginning of the trail. In May, the park hosts a great flower market in honour of the patron saint of the area, Sant’Ubaldo. Piazza Santa Caterina: the name of the square is actually Piazza Martiri della Libertà, but everyone knows it as Piazza Santa Caterina after the beautiful church that opens onto this tree-lined pedestrian area in the heart of the city. One of the best universities is located here: Istituto Superiore Sant’Anna. This square makes for a perfect stop if you are tired of exploring the center. 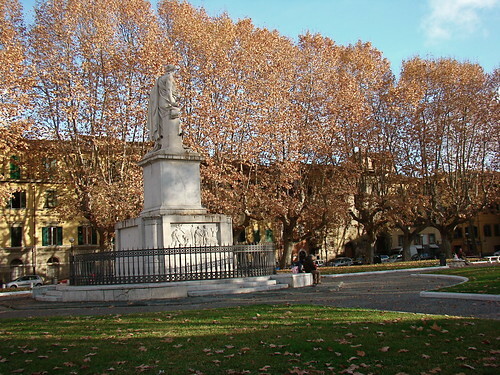 Piazza San Paolo a Ripa d’Arno: this is one of my favourite spots in the city. Located on the opposite side of the river with respect to the Cittadella Tower, this is one of the oldest and most mysterious squares in Pisa. The beautiful church of San Paolo a Ripa d’Arno opens on a garden with tall trees. Legend says that on the riverbank here, Pier delle Vigne, a very famous poet, committed suicide after the false accusation of betrayal by his lord Frederick II. 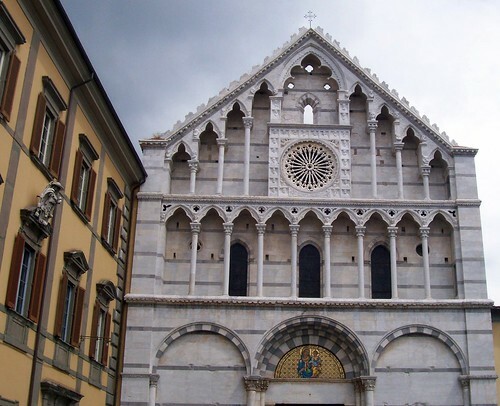 San Paolo a Ripa d’Arno was founded in 803 and it is also known as Duomo Vecchio (Old Cathedral). Just around the corner from the church of San Paolo is the Chapel of Saint Agatha: this little octagonal chapel dates back to the 11th century, when the Pisans had it built to celebrate their victory over the Palermitans. Orto botanico: one of the prides of Pisa. Created in 1544 for Cosimo I de’ Medici, it was the first university botanical garden in Europe. It is not far from the Leaning Tower and it represents a real oasis for those who wish to escape the crowds. I have spent countless hours in the garden, right by the old magnolia tree, studying for my exams. Now I can still see it from my office! The garden is open in the morning and the entrance fee is very modest (less than 3 euros I think). I highly recommend visiting it. Parco di San Rossore: just outside the city, the Park of San Rossore is an amazing place with a thick pine tree forest and paths, ideal for biking, walking and horseback riding. For those who believe that Pisa is just the Leaning Tower, here are some Pisa itineraries “beyond” the Field of Miracles! Gloria, you should visit England and Wales in the summer. We have a scheme here, called the National Gardens Scheme, where private gardens are open for all to visit and admire. There is a small charge and the money collected goes to charity. The organisation has been going since 1927 and has so far raised over £45 million. We visit scheme gardens three or four times a year. The gardens are fantastic; there is usually tea and home-made cakes for sale and often plants as well. We favour visiting villages where several gardens at the same time. You can wander from garden to garden, enjoying the horticulture, architecture and scenery; and if time allows settle in a pub garden for a couple of pints of best bitter. My idea of a perfect Sunday, in fact. I’ve just found out, thanks to Suzy Kane of Idyllic Italy that there will be an extraordinary garden opening on Sunday September 20th in Pisa, Lucca and Siena and on the 27th in Florence.